Sally Derby is the author of many books for children, including Kyle’s Island, Sunday Shopping (Lee & Low), Jump Back, Paul: The Life and Poems of Paul Laurence Dunbar (Candlewick), and No Mush Today (Lee & Low). Sally lives in Cincinnati, Ohio. Mika Song is a children's writer/illustrator who grew up in Manila, Philippines, and Honolulu, Hawaii, before moving to New York to study animation at Pratt Institute. She is the author/illustrator of Tea with Oliver. Through 24 sensitive poems, Derby (Jump Back, Paul) presents six students' perspectives before, during, and after the first day of school. The children represent different grades, kindergarten through fifth, and their perspectives, voices, and concerns are realistically varied. "We were making calendars/for September,/and all my twos were backward," confesses Katie, a mortified second grader. fourth grader Carlos, whose poems are dotted with Spanish, worries that there aren't any other kids with "brownish skin/and black hair like mine" in his class. And fifth grader Mia, who uses hearing aids, winds up at a desk near the door "where the hall sounds get in the way of what I need to hear." Set against white backgrounds, Song's (Harry and Clare's Amazing Staycation) spare ink-and-watercolor images focus on the kids, and their body language and expressions dovetail gracefully with the interior worlds painted in Derby's poetry. 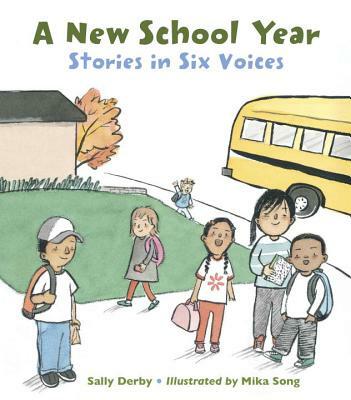 *At the start of a new school year, six children tell of their worries, hopes, and growth in 24 free-verse poems. The book is divided into four sections, with one poem for each of the six children in each section: "The Night Before," "In the Morning," "At School," and "After School." The children and their situations are quite diverse: Ethan is a blond, white kindergartener who lives with his mom, with his grandpa in a nearby apartment; Zach is a confident black first-grader; shy second-grader Katie's skin is light brown, and she lives with her mom and grandmother; Jackie is a blonde, white third-grade latchkey kid; Carlos is a Latino fourth-grader whose poems are sprinkled with Spanish; and Mia is an Asian fifth-grader who wears hearing-aids. While none of the poems by themselves stands out as anything amazing, the four separate poems each child is allotted combine to paint a picture of a full character: Ethan carries Bear's jacket in his pocket and draws extra family members since his little triad looks lonesome on the white page. But he resolves to own up and to leave Bear's jacket at home tomorrow. And altogether, the collection presents readers with snapshots of first days across the spectrum of grades, from stomach butterflies and new-teacher worries to class jobs and making both mistakes and new friends. Song's watercolor-and-sumi ink illustrations clearly show the kids' emotions and some of the sights common to almost all classrooms. Diverse in so many ways, this could be a springboard to readers' own poems about school. Ethan, Zach, Katie, Jackie, Carlos, and Mia prepare for the first day of school. Entering kindergarten through fifth grade, respectively, the children face uncharted territory and cope with their circumstances in different ways. The six kids are of various backgrounds and have a broad range of worries and habits, but they're unified in their anxiety. Amid their uncertainty, the children are pleasantly surprised when their first days turn out to be better than expected. Neatly packed into four sections—"The Night Before"; "In the Morning"; "At School"; and "After School"—Derby's poems guide readers through each child's experiences during the 24-hour period. Designed as vignettes, Derby's free-verse stories depict common themes, which nicely evoke the typical emotional struggles children preparing for their first days of school frequently face. Song's muted watercolor illustrations capture tranquil snapshots of everyday life as well as evocative facial expressions conveying the many moods portrayed in Derby's candid storytelling. Kids anxious about their first days will likely be comforted by this easygoing collection.